We asked Maître Cuisinier de France Herve Malivert to tell us a bit about what it means to him to be an MCF chef. He told us “I’m proud and honored to be a Maître Cuisinier de France, to be part of this prestigious association. My motto it is to spread the French Culinary Arts, and the best way for me to do it, is here at International Culinary Center to teach the French tradition, to aspire young cooks to pursuit their passion. If you want to learn from Master Chef Malivert, or taste his creations and those of his students, stop by the International Culinary Center in NYC. It was founded as the French Culinary Institute by Dorothy Cann Hamilton in 1984 and has locations in New York City, the San Francisco Bay Area and Parma, Italy. The facilities include industrial kitchens for hands-on cooking and baking classes, specialized wine tasting classrooms, libraries, theaters, and event spaces. The Center has several renowned chefs as its deans including Jacques Pépin, Jacques Torres, André Soltner, Alain Sailhac, David Kinch, Emily Luchetti, Cesare Casella, José Andrés, and Alan Richman. Our Program: Classic Culinary Arts and Pastry arts is a six to nine month program that teaches students classic French techniques and training for the stations on the line at Center’s restaurant, L’Ecole. The International Culinary Center also offers a cake, sommelier, bread, Italian, and Spanish program + plus a variety of amateurs programs. Maître Cuisinier de France Jonathan Jerusalmy is the Resort Executive Chef and Director of Culinary Programming at Sea Island. He received his Bachelor of Arts in food service, wine technology and hospitality management from the Institute Technique des Métiers de L’Alimentation in Tournai, Belgium. Early in his career, he interned at some of France’s most coveted Michelin-rated restaurants, including those of Master Chefs of France, Paul Bocuse and Gerard Boyer. 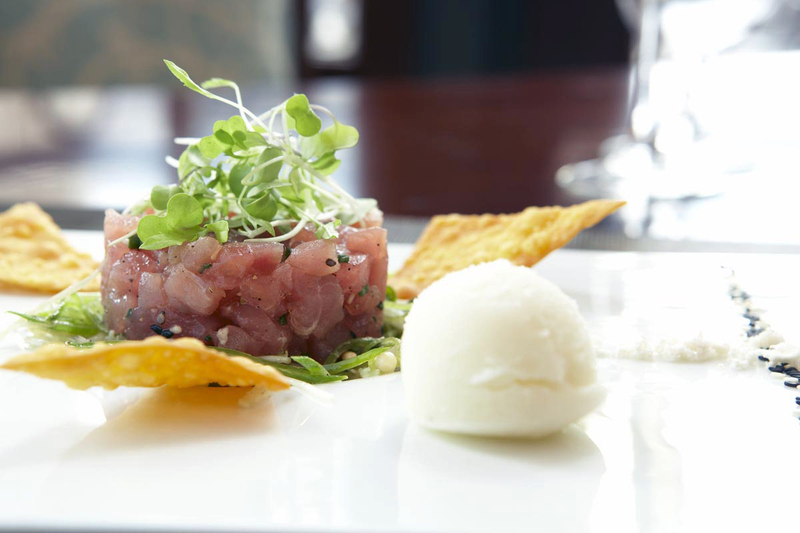 Today, Chef Jerusalmy shares with us his very special Tuna Tartar Recipe. He told us that “This was a dish that I created when I opened the St Regis Atlanta, it is refreshing and it is the perfect dish to share between friends.” We think you will love sharing it with your friends too. Place the tuna on a chopping board, and remove the skin. Cut it into rounds of (1/4-inch) thickness, and then cut it lengthwise into strips of about (1/4-inch) square. Whisk all ingredients together and freeze according to ice cream maker’s instructions. Mix both ingredients together until you obtain a light powder. Mix the tuna with the chopped cilantro and scallions add some of the soy ginger vinaigrette and coat them in it, ring the tuna in to a mold and place the tuna on top of the Asian slaw nest. Add some wonton crisp for decoration. 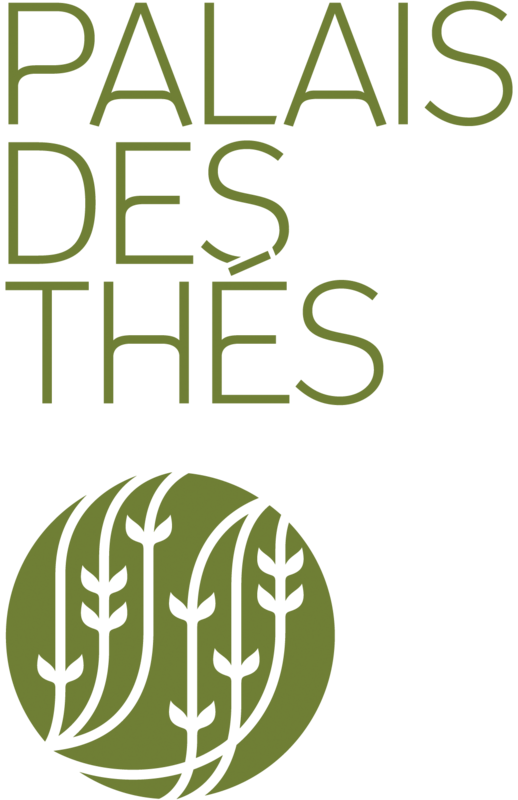 For the first time ever, the 59th General Assembly of the “Maitres Cuisiners de France” will be held in the United States from March 5-9, 2014. The event will also celebrate the 50th American and Canadian delegations and the U.S. Chapter of “l’Academie Culinaire De France” (ACF). The location for the 59th General Assembly will be Las Vegas Strip, specifically The Venetian and The Palazzo. 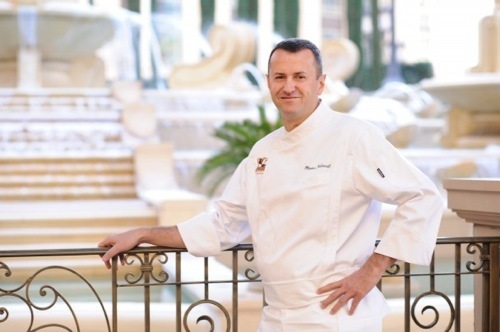 The Venetian and The Palazzo Executive Chef Olivier Dubreuil is also a Master Chef of France. It was through his hard work and dedication to the organization that his invitation to bring the meetings to America was accepted. The Association of “Maîtres Cuisiniers de France” employs nearly 10,000 qualified people and is also closely involved in the activities of the Regional Commissions for vocational diplomas and certificates granted by specialized schools. It participates actively to promote products of “top Anniversary of the quality” such as the Red Labels and “Appellations d’Origine Contrôlée” or European signs of quality, such as the IGP, AOP and STG. 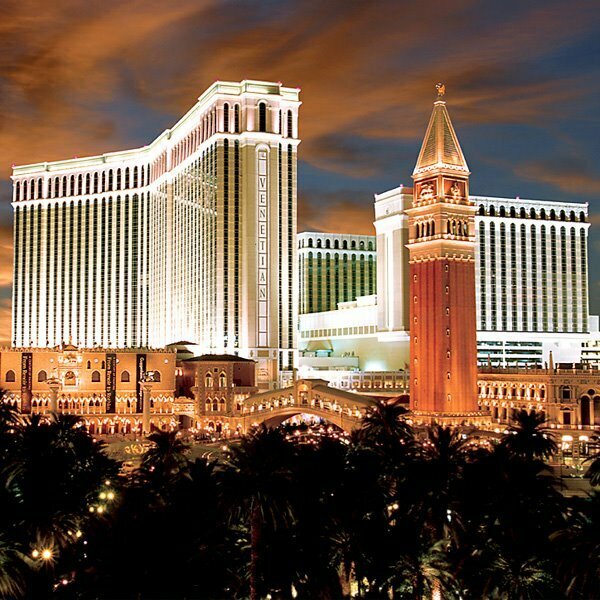 In March, nearly 150 Master Chefs will stay at The Venetian Las Vegas to review the previous year’s accomplishments, look ahead to next year and find ways to help other communities promote upcoming events. In addition new members will be added to the Master Chef list with an induction ceremony. The “l’Academie Culinaire de France” will also host a special dinner to elect the woman of the year and reward one of their member with the “Fauteuil de l’ Academie” for lifetime achievement. Master Tour De France – Saturday March 8 from 6pm-10pm – Doge’s Palace – 12 Chefs, 12 wineries and spirit makers will showcase specialties from different regions of France – Open to the public – must be 21 or older with valid I.D. Tickets are $50.00 all inclusive. 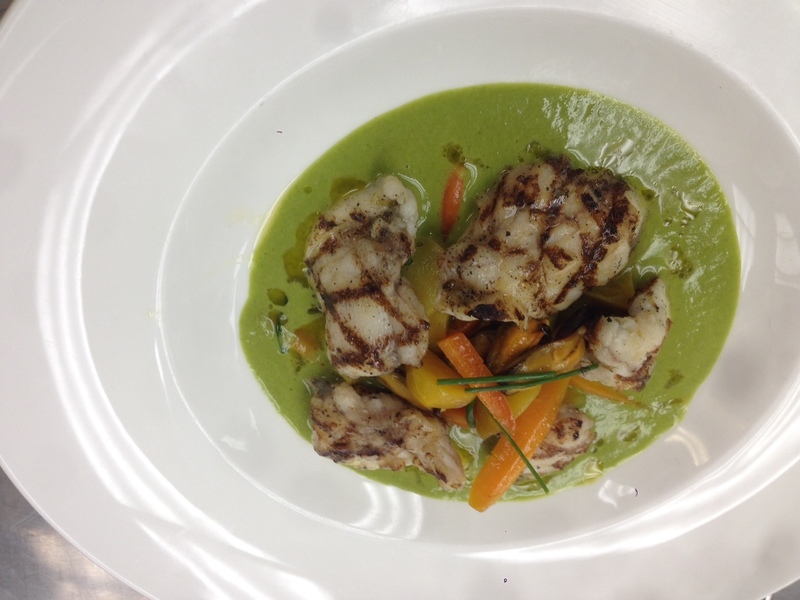 Master Chef Roland Passot is not just passionate about cooking. He is passionate about doing good deeds. He has signed up for “Brave the Bay” as part of the Executive Challenge Plunge to take place Saturday December 7th. 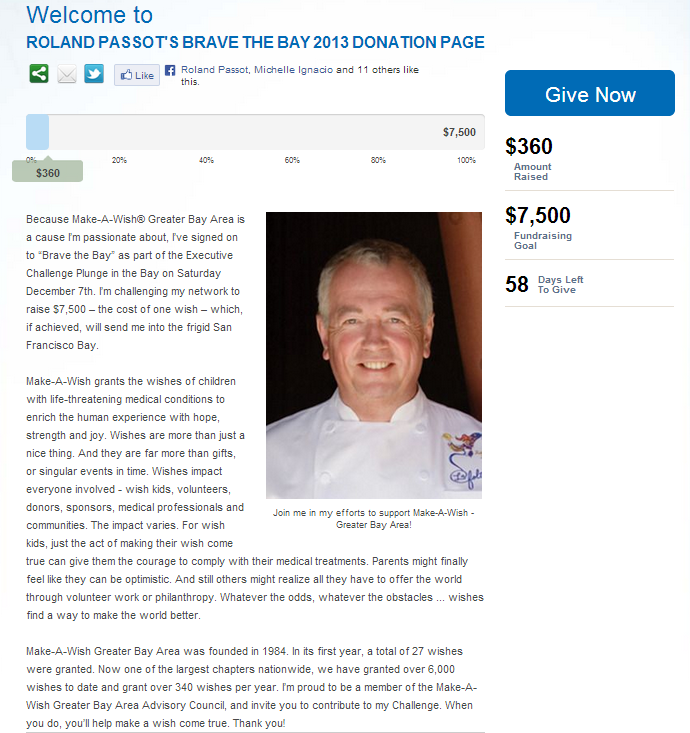 Chef Passot is looking to raise $7,500 – the cost of one wish –if the goal is achieved, you’ll be sending him into the ice cold waters of the San Francisco Bay. Master Chef Jérôme Ferrer has received many accolades. This year, Restaurant Europea was selected as one of the Great Tables of the World. This designation will officially take effect in January 2014 and is shared by only 158 institutions in 22 countries on four continents, and their commitment to culinary purity. Receive a minimum of a 2 Michelin star rating. In celebration, Europea will offer a special Great Tables of the World luncheon 4-course menu at $35, and a seven-course discovery table d’hôte in the evening at $79.50. Maître Cuisinier de France Guy Reuge of Mirabelle Restaurant at the Three Village Inn is being honored for his outstanding community service and his commitment to the Lourie Center for Pediatric MS at Stony Brook Medicine which provides help to children and adolescents with multiple sclerosis and advances leading-edge research. at Villa Lombardi’s located at 877 Main Street in Holbrook, NY. 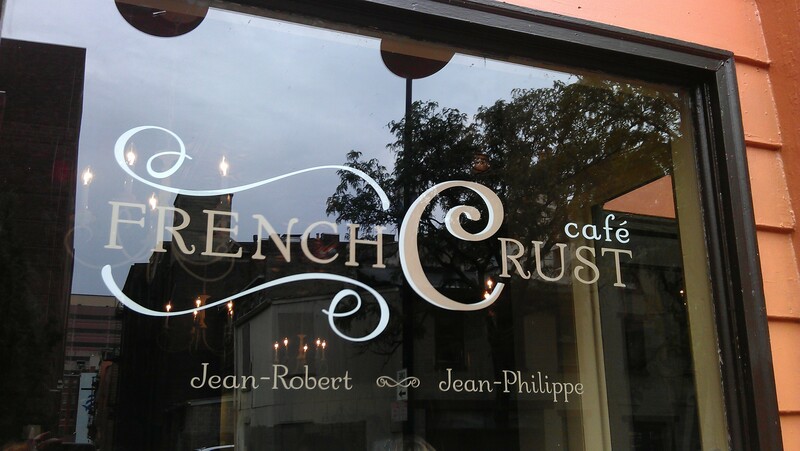 Master Chef of France Jean-Robert de Cavel (owner of Jean-Robert’s Table), has opened his second restaurant, French Crust Café, at 915 Vine Street, in downtown Cincinnati. The restaurant will serve breakfast and lunch and feature scrumptious desserts by pastry chef and chocolatier, Jean Philippe Solnom. Maitre Cuisinier de France Cavel said that “Jean-Philippe and I have talked for a long about opening a café just like this. So when the space became available, it was the right opportunity to collaborate with my longtime friend, Jean Philippe. Especially because it is so close to the Table”. French Crust Café will have capacity for 26 people and will offer French pastries such as croissants and brioche, fruit tarts, as well as soups, sandwiches, quiches, and casserole entrees. The café will have a casual elegant feel with an ecclectic touch. Mon-Fri 7 a.m. to 4 p.m. Lunch 11 a.m. to 2 p.m.
Coffee and pastries are available all day. Master Chefs Eric Ripert (Le Bernadin) and Laurent Manrique (Millesime, Cafe de La Presse, Rouge et Blanc, Blanc et Rouge, and Acquitaine) will be participating in the 2013 Bid Against Hunger. Last year, the event had over 900 attendees and over one million dollars were raised in benefit of City Harvest. Attendees of the 2013 event will have the chance to bid on prizes in a live and a silent auction. Prizes include luxurious dinners with chefs, getaway packages, sports memorabilia, and musical event tickets. VIP guests get an exclusive tasting of luxury foods, hors d’oeuvres, and top of the line wines. Make sure to say hello to the Master Chefs and have a great time at the event. 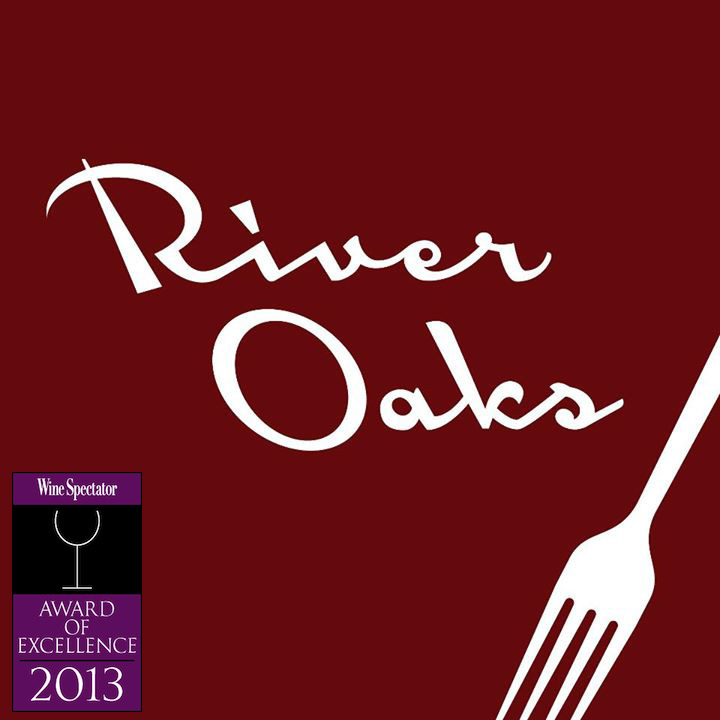 River Oaks Restaurant which is led by led by Master Chef José Gutierrez has received the 2013 Award of Excellence from Wine Spectator for their wine program. This prestigious award is given to restaurants with an exceptional selection of high quality wine, along with a thematic match to the menu in price and style. Congratulations to Chef Master Chef Gutierrez and his team. 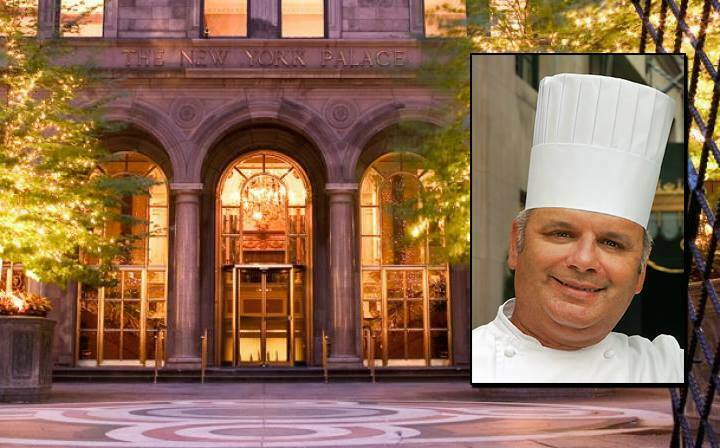 The New York Palace has named Chef Jacques Sorci as their new Executive Chef. As part of their exciting multimillion renovation, Master Chef of France Jacques Sorci will be overseeing the food and beverage operations of The New York Palace, a luxury hotel in midtown New York. Chef Sorci has worked in some of New York’s most prestigious kitchens including The Carlyle New York (Executive Chef), The Ritz-Carlton Hotel Company (Battery Park – Executive Chef and Director of Food and Beverage). Sorci also worked at other Ritz-Carlton properties including The Ritz-Carlton, Marina Del Rey (Executive Chef), The Ritz-Carlton, Tyson’s Corner (Executive Chef), The Ritz-Carlton, Huntington (Executive Sous Chef), The Ritz-Carlton, Aspen (Restaurant Chef), and The Ritz-Carlton, Atlanta (received training for Aspen). Sorci has comprehensive international experience as well, such as his tenure as Chef de Partie with the Noga Hilton International hotel in Geneva, as Demi Chef de Partie at Michelin Star-rated restaurant La Perle du Lac in Geneva, and as Pastry Chef at the Michelin Star-rated Restaurant Salomon in Montmelian, France. 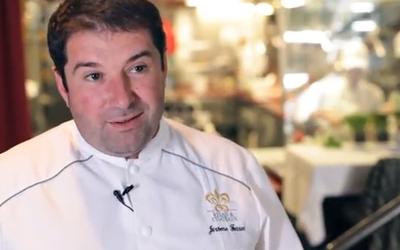 Jacques Sorci received his culinary education at The Hotel School of Thonon les Bains where he completed training at the Five-Star Le Grand Hotel in Cabourg, France, and the Five-Star Brussels Hilton in Belgium. Sorci’s professional career began in France and Switzerland, where he worked with Michelin-rated La Perle du Lac in Geneva, and with Maitre Cuisinier de France, Jean Salomon in Montmelian. In 2003, Chef Sorci was inducted into the Maitre Cuisiner de France – a designation bestowed only upon 19 chefs in New York and 65 chefs nationwide. The elite members of Maitre Cuisiner de France are selected through a strict review process that takes into account the chef’s restaurant experiences, technical expertise, business qualifications and cultural standing in the culinary community.